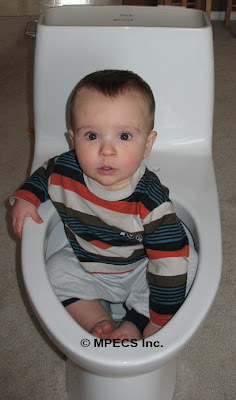 MPECS Inc. Blog: As some things appear to change ... A toilet change experience. As some things appear to change ... A toilet change experience. Before getting into I.T. full time, I was big into working on cars. I am only a few hours short of my journey man's mechanic ticket along with some courses and a couple of exams. I also did a lot of sub-contracting for renovators and house builders. Along came computers, and the rest as they say, is "history". One of the things that I still enjoy doing is working on cars, carpentry, plumbing, and electrical work. There is no shortage of these types of tasks in our own home and friend's homes. We just moved into a house that is about 13 years old. Some things needed to be changed as they had seen their day. Two of those things were the toilets. The old ones would not stop the water filling the tanks and thus were wasting water. They wouldn't stop the flush cycle, and they used a large volume of water for the flush cycle of about 20 or so litres. It is a Toto that comes highly recommended by a Master Carpenter friend of mine, Joe Stelmaschuk of Master's Custom Finishing. It uses a Push/Pull style of flow with 6 litres of water consumed per flush. Going from 20+ litres to 6 litres is a huge savings in water consumption! The process of swapping out a toilet is actually very easy and can be accomplished in under an hour for the one piece toilet that I was installing. The reason for this post is because the technology that mates the toilet to the flange in the floor is ancient. It is a wax donut. Yes, wax. Just think, a couple of hundred years ago, the wax candle was probably the primary form of lighting for most people. Wax was prevalent. And, to this day, wax has survived as the material of choice for this task. 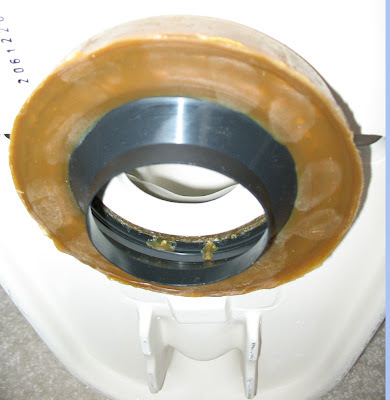 The wax is pliable enough to mold itself to the bottom of the toilet and to the floor flange, thus providing a perfect seal. 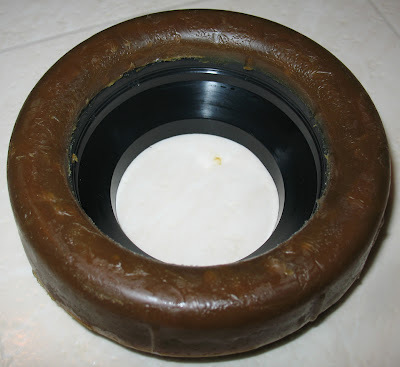 There are two types of wax donuts, one with an additional flange extender (seen here), and just the wax donut. We needed the extender due to the fact that the flange on the bottom of the toilet was very short. When changing out a toilet, one also needs to change out the cold water fill pipe/hose with a new braided hose to ensure no leaks form at that point. The critical part of the whole procedure is making sure to centre the toilet over the floor flange before setting it down so as to not damage the wax donut. That can be a challenge if the toilet is heavy as the one piece ones are. Given this information, there are a couple of very important notes to consider when it comes to something we take for granted: toilets (water closets). Never pour hot or boiling hot water, hot fluids, or hot solids down the toilet! This may melt the wax seal to the point where whatever is flushed can get under the toilet. Never seal the base of the toilet with silicon. If the wax seal gives away, you will see some yellowish sticky stuff coming out from under the toilet. This gives a visual clue that the seal needs to be replaced. 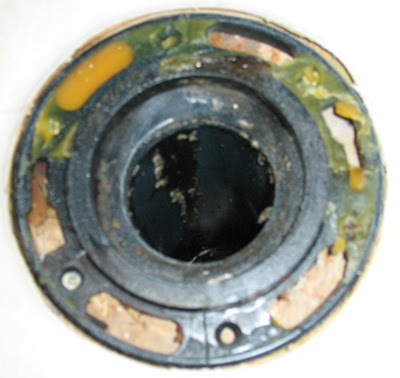 If the toilet base is sealed, the eventual leak will build up under the toilet with ugly results. If something gets stuck deep in the toilet and a plumbing snake is needed, be careful with it as that may damage the wax donut seal. All in all, putskying around like this is a great way for me to relax :D.
Wikipedia's history of the Water Closet (Toilet).